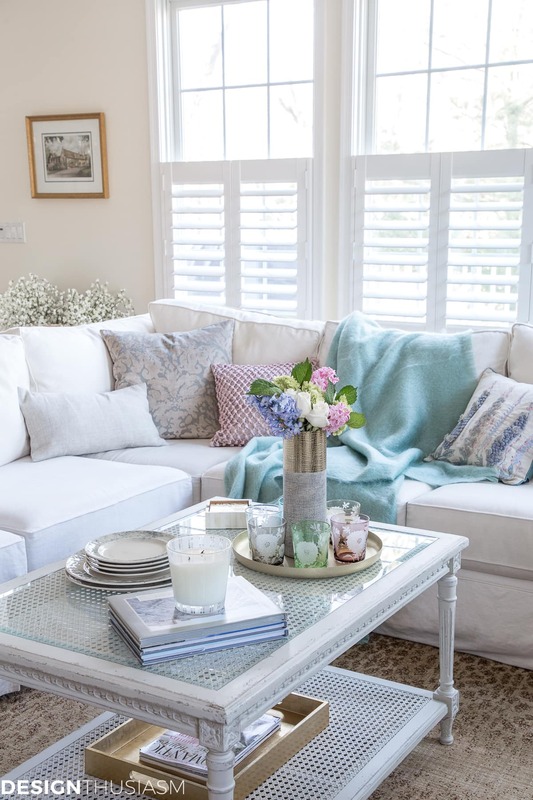 In this post: One of the simplest, easiest and least expensive ways to add seasonal color to your neutral home is by adding spring decor accessories to your rooms. You all must think I’m crazy. 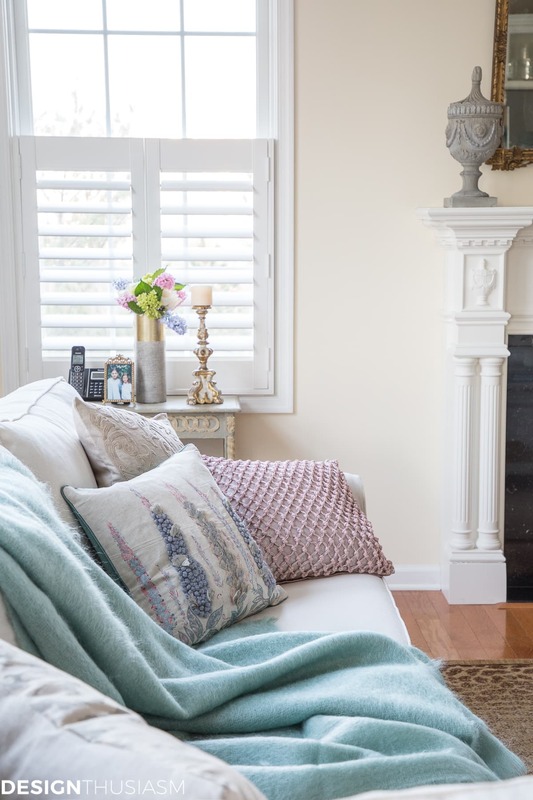 I’ve been reworking my home, room by room, paring back the look to refined neutrals, removing much of the color and presenting the finished product with an air of satisfaction that says, “yeah, that’s so much better”. And then a week or two goes by and that very same room is wearing a whole new palette of celebratory color. But there’s a method to my madness! I promise. Today I’m joining a wonderful group of bloggers for the Seasonal Simplicity Home Tour Series, hosted by Krista of The Happy Housie. 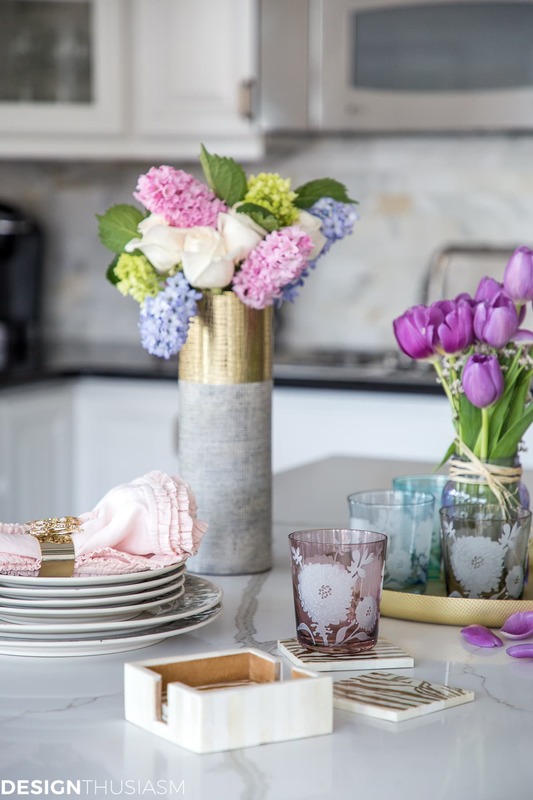 For this tour we’re focusing on several rooms in our homes, so there’ll be lots of spring decor inspiration to go around! If you’re coming over from Confessions of a Serial DIYer and are new to the blog, let me welcome you! Please be sure to check out all the other tours linked at the bottom of this post. I also want to thank my sponsor, Amara, for proving the beautiful accessories that are at the heart of this post. You see, that was exactly the point. While I do enjoy my neutral rooms in their elegant neutral glory, I still enjoy playing with color. 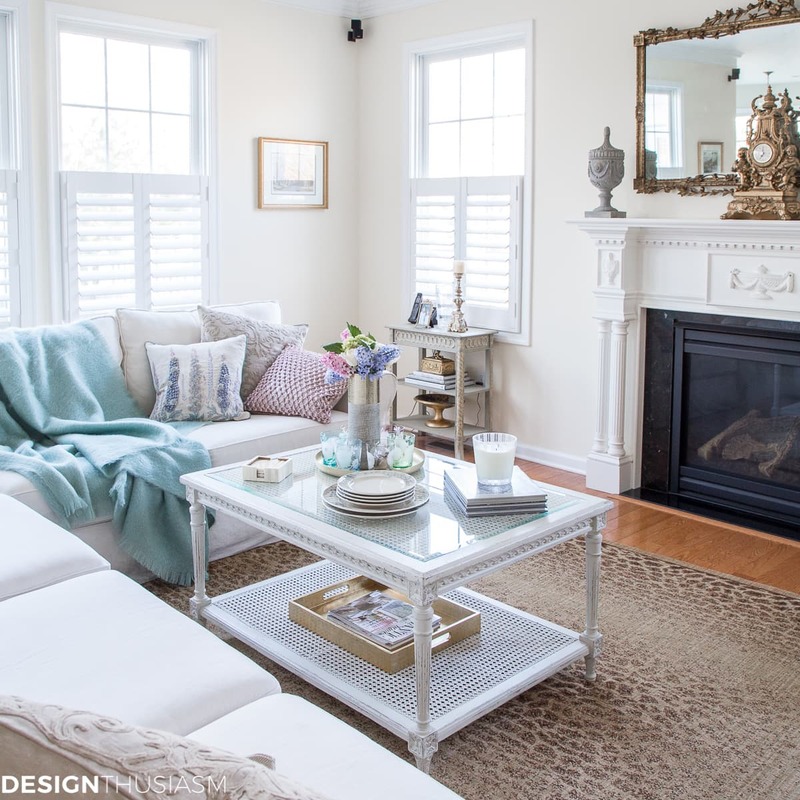 And it’s far easier to bring a new palette into a neutral room for seasonal flavor or even on a whim, than to try to shoehorn a specific hued room into a different color direction that could potentially clash. A neutral base allows you to explore alternative visual themes as the mood strikes, rather than constraining you to a predetermined look. For spring I’ve brought a lovely ambiance into my home, inspired by Amara’s Greenhouse Trend. The look utilizes sophisticated pastels, timeless florals and botanical prints to bring a touch of nature into the home. Today’s tour will feature three of my rooms, refreshed for the season using only accessories. This illustrates how you can do the very same thing to any of your rooms with a neutral backdrop. 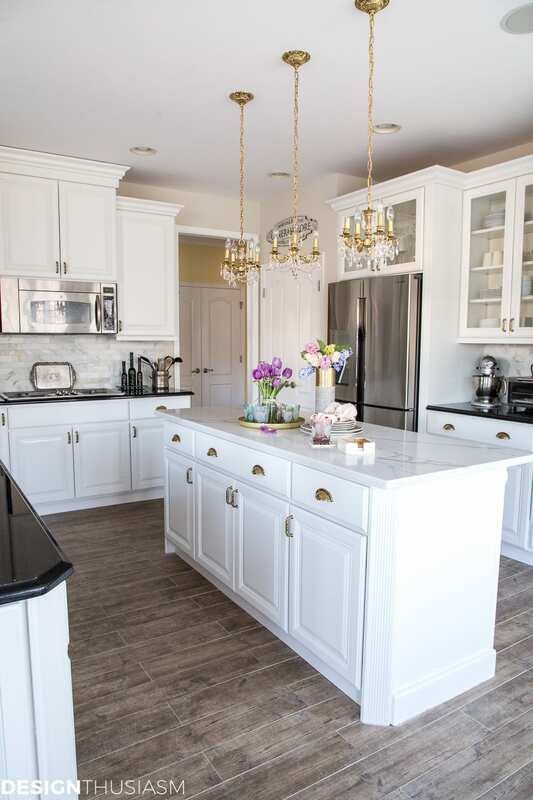 For a peek at my house tour on Amara’s home inspiration page you can click HERE. A little color goes a long way and in a living room or den a strong statement can be made using primarily pillows and a throw or two. 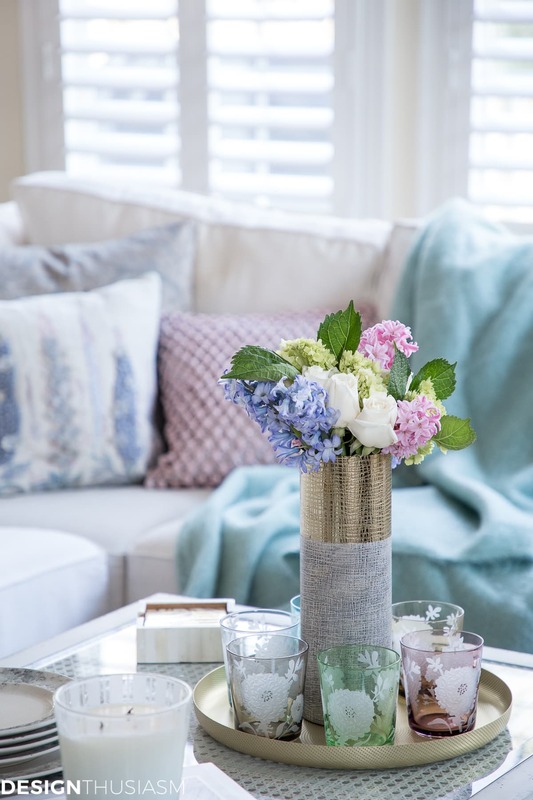 Much like styling a table or really any room, the key to communicating a concept is to find a pivotal piece that embodies the theme, and then surround it with items that complement that look. In this case, the botanical appliqué pillow is the central piece, bolstered thematically by the blush crochet pillow and mint mohair throw. 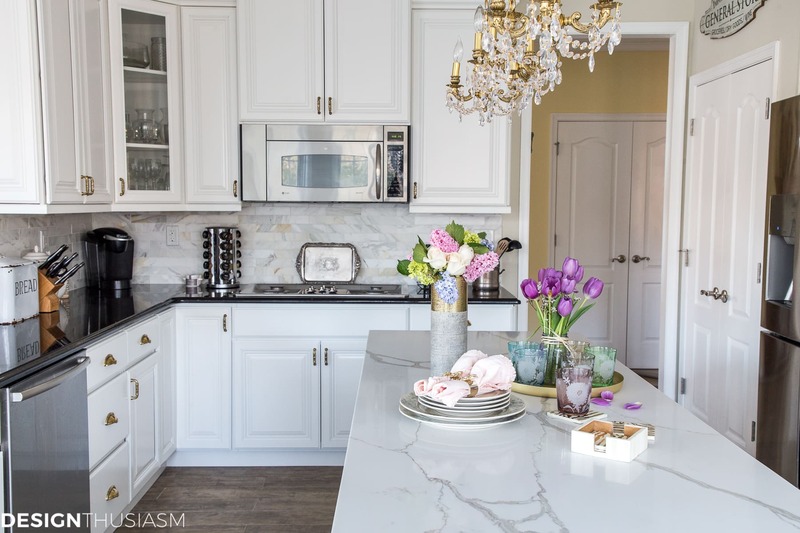 Moving into the kitchen, the white center island provides ample opportunity to add spring decor through the same soft palette. It’s remarkable how different the room looks, simply by adding a new vignette to this central location. Our kitchen is a mix of several elements, contrasting casual and formal, as I love to do. 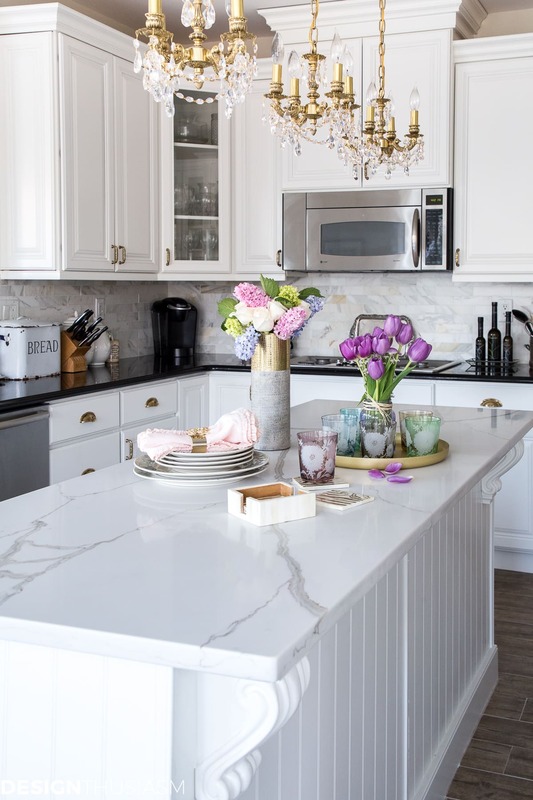 The crystal chandeliers and marble backsplash speak directly to my elegant side, while the antiqued flooring and chippy signage appeal more to my country-loving self, keeping it all from getting too serious. The greenhouse trend taps into both sides, blending country flowers and pretty pastels with pops of gold for a punch of polish. Of course, fresh flowers are part of all my styled rooms, and I love how their look is reflected in the charming peony tumblers. Tinted in an assortment of colors and adorned with sandblasted blooms, they’re served up on a golden tray anchored by a cluster of tulips. The taller vase combines rustic patina with a brass plated rim, another nod to casual elegance, while the zebra coasters mingle white bone with gold inlay for a hint of luxe. Stoneware plates are stacked neatly on the island, but I’ve also used them on a table setting in the dining room. They look lovely paired with pink linen napkins and my new favorite butterfly jeweled napkin rings. 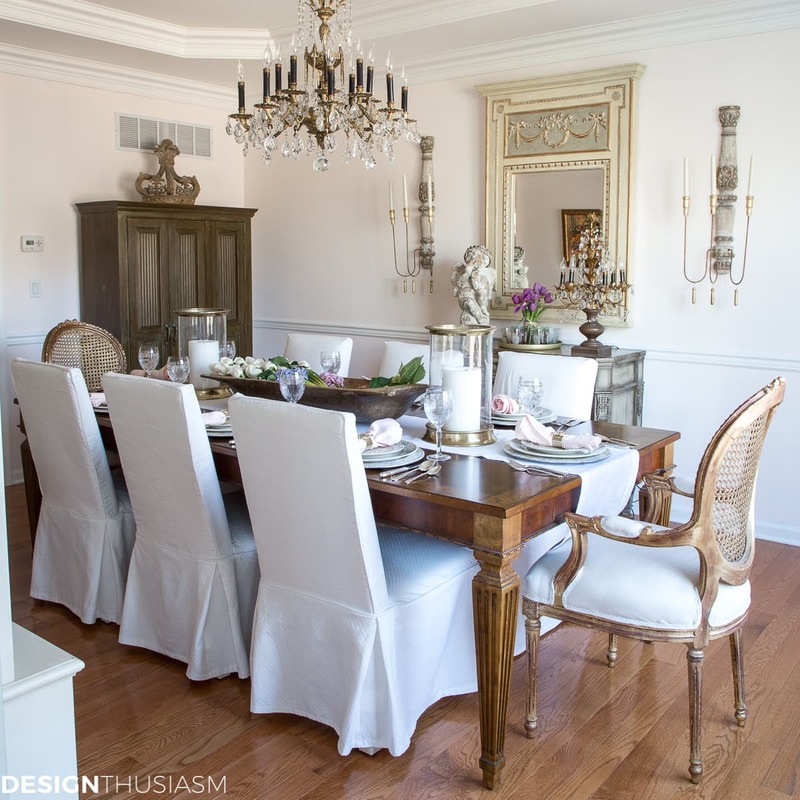 You can see more of the spring dining room in this earlier post, with full details of the table and decor. I’m absolutely delighted to have my home decorated in a way that’s easy to refresh for the season. I still have some rooms left to go that will also be moving toward a neutral underpinning. I love being able to add color and style without spending a fortune on new furniture, simply by layering in beautiful accessories! 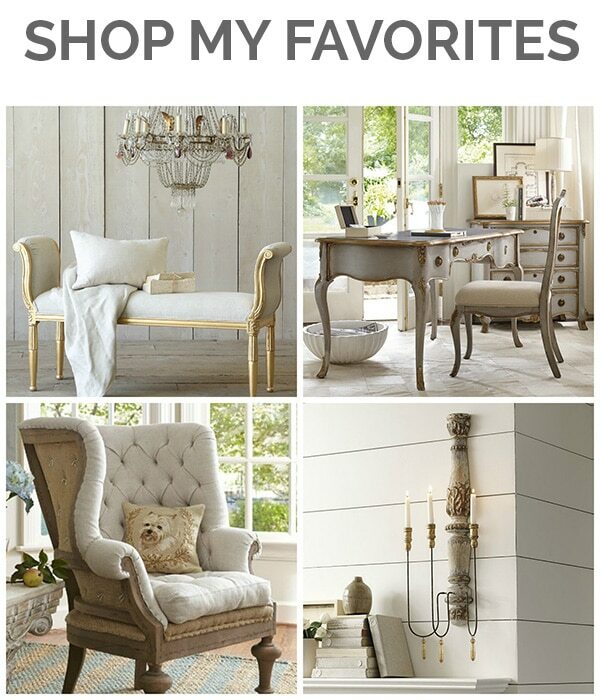 Spring Decor Source List – To get the look, click on the items below for direct links to the products. Where actual items were no longer available, I’ve provided similar options. Next up on the tour is House by Hoff. April is so creative and I know you will enjoy her post! 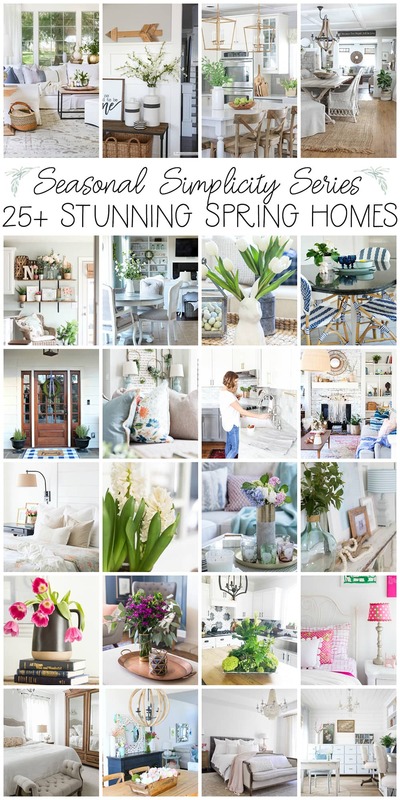 You can find all the other spring decor tours below, starting with today’s posts. Beneath that you’ll find the week’s full line up. Enjoy! Beautiful tour Lory, and I love your tips for adding spring colour! Your home is stunning. Thank you so much for sharing it with us all and being part of this tour series. Thank you, Krista, so much for hosting such a great tour and including me!! Lory, I love those new additions from Amara! Just gorgeous. It’s always such a joy to see a home tour from you. 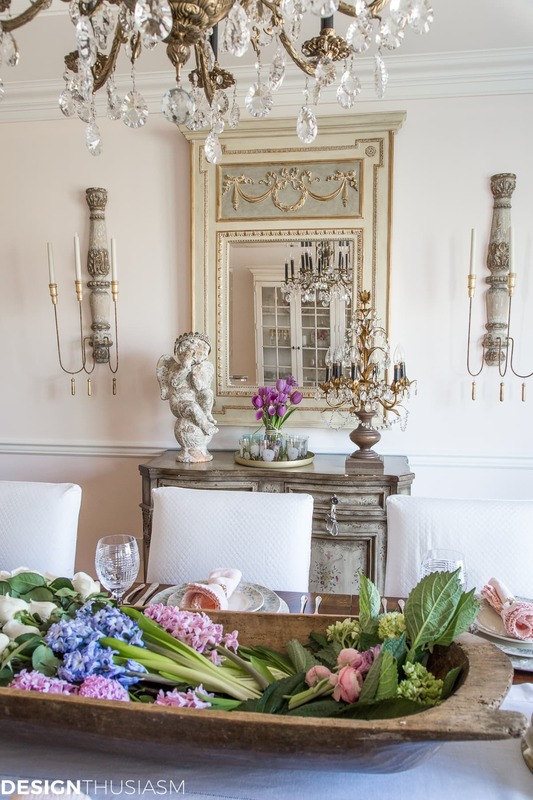 I love all the pretty vignettes and flowers you’ve added for spring. Thanks, Jamie! Always how I feel about you, too… 🙂 Haven’t gotten to your post yet but I’m swooning from the teaser, so I’m definitely getting over there!! Such a beautiful home and photos Lory! I too love a neutral background,and then go crazy or laid back with color! Depends on how you feel when you wake up in the morning! Absolutely true, Ginger! And thank you, too!! I love all the fresh spring flowers! And the lights above your kitchen island are AMAZING! Such a gorgeous home! Oh I love this post Lory! The subtle, soft colors look so pretty for spring! And I’m IN LOVE with the glasses!! You have an absolutely stunning home, Lory! It’s perfectly elegant and inviting. I love all of your soft spring touches! Beautiful as always. I am still getting used to having neutral fabric to work with. I know most colors work. I’m so used worrying I’m still over thinking. Your home is gorgeous! 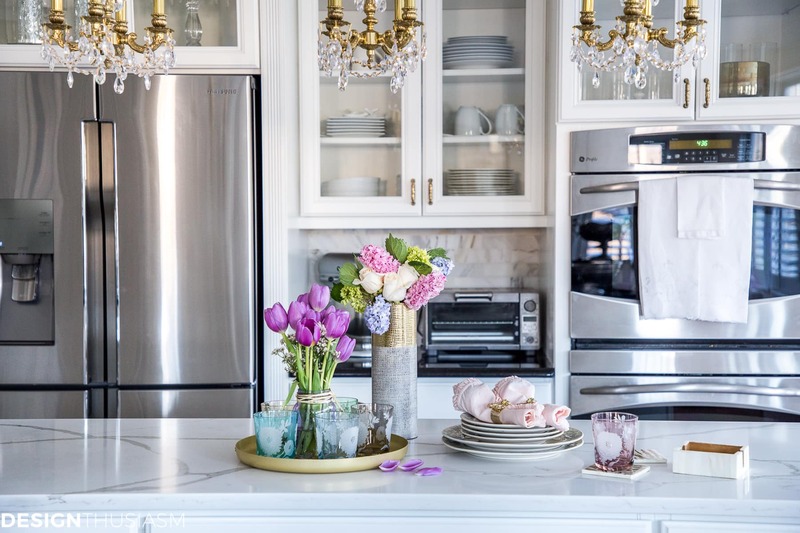 I love your all white kitchen and pops of color! So lovely! Thank you for sharing! Lori, You speak my language. Love the pops of blues and pinks against the neutral background. And, of course, the way you put accessories together is delightful and interesting.